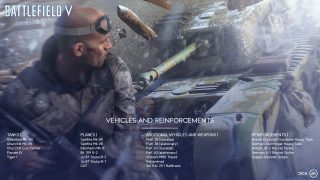 Learn about the weapons, vehicles, modes, and how to get a full week’s access starting September 4. We’ve already covered the basics of the Battlefield V Open Beta in a previous article – go ahead and read it if you want a quick run-through. But this is the deep-dive. Let’s take the plunge. When is the Open Beta Live? Why are We Doing an Open Beta? 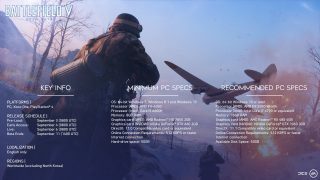 Similar to what we’ve been doing in the two Closed Alphas, the Battlefield V Open Beta lets us test Battlefield V running in a live environment with a high player count. We’re testing technical aspects like server stability, latency levels, and matchmaking as well as gameplay – weapon balancing, progression, and other ingredients that we want to optimize to make the game as fun as possible. It’s also an opportunity to collect feedback from participating players. Give us your comments and feedback on the Open Beta on the Battlefield Forums. If you experience Open Beta issues, head to Answers HQ. The snowy Norwegian landscapes of the Arctic Fjord map return from our recent Closed Alphas, and here you’ll be able to play both Conquest and two “days” of the Grand Operation Fall of Norway. Those are in-game days, by the way – not the 24-hour kind. Grand Operations contain several of these days, with one game mode featured in each. In Fall of Norway, Day 1 will be spent in the Airborne mode, where you’ll paradrop down to the battlefield and be on either side of a fight where explosives are deployed on control points. Day 2 features Breakthrough, where your team either attacks or defends vital sectors. In this mode, stay aggressive and tactical as an attacker – or use on-the-fly planning to keep the enemy at bay when defending. Then there’s new scenery to explore: Rotterdam. You’ll fight in the streets of the Dutch city in its pristine, pre-war state before battles left it in devastation. Deploy on this map and try the signature Battlefield game mode: Conquest. Returning to classic rules, Conquest is a 64-player fight where two teams fight for control over key flags on the map. Hold the majority of these points to drain the opposition’s score and win the day. Five iconic WW2 tanks and seven aircraft will be at your disposal in the Battlefield V Open Beta. 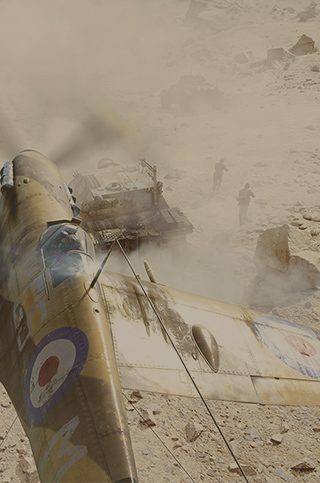 Deploy as a Tanker and bring the big guns to the fight – including the Valentine Mk VIII, Churchill Mk VII, Churchill Gun Carrier, Panzer IV, and the Tiger I. If you prefer soaring through the skies, support your team from above in the Spitfire Mk VA, Spitfire Mk VB, Blenheim Mk IF, Bf 109 G-2, Ju 87 Stuka B-2, Ju 87 Stuka B-1, and the C47. In addition to this, you’ll be able to fend off flying foes with stationary and towable AA Guns. Tanks giving you trouble? Use the Anti-Tank Guns, also stationary or towable. A Squad Leader who’s collected enough Squad Points will get the thrilling opportunity to unleash the powerful Reinforcements. If you played any of the Closed Alphas, you’ll recognize the terrifying sight of the two heavy tanks: the British Churchill Crocodile and the German Sturmtiger. Also returning from the Alphas are the JB-2 and V-1 Rocket Strikes that will send enemies flying. New this time around are the Supply Canister Drops. These are sources of health and ammunition, para-dropped in the battlefield at the cost of 7,500 requisition points. The four main classes are available in the Battlefield V Open Beta: Assault, Recon, Medic, and Support. 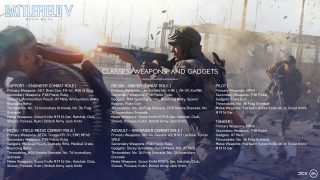 Each class will have several Combat Roles in Battlefield V, and in the Open Beta, you’ll get to try one for each Class. Every Combat Role comes with unique traits. If you, for instance, play as Recon, its Sniper Combat Role will grant you the Tactical Retreat trait, meaning you’ll sprint faster in critical health states. The Field Medic Combat Role comes with a Syringe Revive trait, which allows you to revive all team mates (not only those in your squad) with your Syringe. Picking a Class in the Open Beta also means – to some extent – picking a weapon type. The Support Class wields the powerful Light Machine Guns, such as KE7, Bren Gun, and FG-42 – but also the M30 Drilling Shotgun. Medic players can play the objective with the sub-machineguns STEN, Suomi KP/31, MP40, and EMP. If you’re in the heat of the battle with the Assault Class, use Semi-Automatic weapons like the Turner SMLE, M1A1 Carbine, and Gewehr 43, or the StG 44 Assault Rifle. If you’re further from battle with the Recon, rack up headshots with the Bolt-Action Rifles – here you can choose between the Lee-Enfield No. 4 Mk I, ZH-29, or the Kar98k. Add sidearms, melee weapons, grenades, and gadgets to this and you’ll have a powerful, versatile arsenal to try out in your Open Beta fights. With Tides of War, you and your personal soldiers of your Battlefield V Company will embark on a journey through themed, different chapters of World War 2, filled with events. With each chapter of Tides of War, players will have all-new ways to play while also being able to earn the latest and greatest themed Battlefield V vanity items. The Open Beta will be your first early look at how parts of the Tides of War will work. You will take part in the Shock Troops Chapter Event, and by completing its challenges during the Open Beta (but before September 9) you can earn the unique Tides of War Beta Dog Tag. The Dog Tag will be awarded in Battlefield V if you decide to get the game. Note that the Shock Troops Chapter Event will only be part of the Open Beta, not the final game. You should know that the Shock Troops Chapter Event is just a small taste of Tides of War – much, much more is coming. Make sure to give us your feedback on how the flow of playing these challenges feels like. 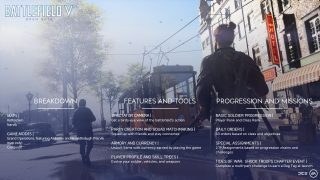 Note that game content, gameplay mechanics, and other Battlefield V aspects covered in this article may change between the Open Beta and the launch of the game. Enter mankind’s greatest conflict on Xbox One, PlayStation®4, and PC. On November 9, play the full game with Origin Access Premier or try it as part of the EA Access and Origin Access Play First Trials. Or, join the fight on November 15 with Battlefield™ V Deluxe Edition early enlister access, or November 20 with the Battlefield™ V Standard Edition.